Help your birds remain well-fed with this Squirrel Buster Plus Squirrel Proof Bird Feeder with Pole, WeatherGuard, and Seed. This remarkable kit provides not only a durable, squirrel proof feeder, but also a new way to mount it and protect the feed from the elements. The included Brome Squirrel Buster Plus Squirrel Proof Bird Feeder is loaded with features to bewilder and halt squirrels from dining, while still offering your birds their favorite seed. An ingenious, spring mechanism rests inside this seed tube, easily adjustable to exclude larger birds and squirrels. A transparent cartridge inside the seed tube can be turned clockwise to increase the weight limit, or turned counter-clockwise for less weight sensitivity. This allows for several weight limit options, and a handy chart comparing the weights of common birds and squirrels is included for quick reference. When the larger animal places its weight on the cardinal ring or one of the perches, a shroud lowers and closes access to the seed ports. This generous feeder holds up to 3 quarts of seed, and the included, 20 pounds of Wild Bird Seed Mix, Divine Blend will delight your feathered friends. Six feeding stations keep the treat easily accessible for the birds. Shorten the perch at each port to allow only small birds to dine, or extend them to invite woodpeckers or grosbeaks to the area. 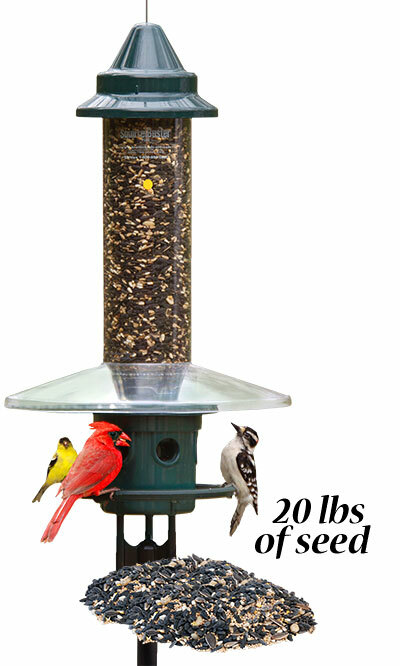 For even more versatility, add the included cardinal ring to the base, for cardinals to feed with ease. Both the perches and the ring have posi-grip, providing birds a textured surface to grip while dining. The included Brome Clear Squirrel Buster Plus WeatherGuard rests on the body of the feeder, protecting each port from the elements, while keeping the feeding activity fully visible. The feeder will look great placed in your yard atop the included Erva Three Piece Birding Pole, which installs easily thanks to the included Erva Ground Socket. The included Brome Squirrel Buster Plus Pole Adapter Kit makes it simple to attach the feeder to the pole, while keeping the weight sensitive mechanism intact. This display adds versatility and style to your backyard, and the plastic and metal construction of the pieces is sure to last through years of use. Bar squirrels from pilfering bird seed using this Squirrel Buster Plus Squirrel Proof Bird Feeder with Pole, WeatherGuard, and Seed. Lifetime warranty on feeder. Qty 1 Erva Three Piece Birding Pole, Black, 6'8" x 1" O.D. Qty 1 Brome Squirrel Buster WeatherGuard, Clear, 13" dia. Brome Squirrel Buster Plus WeatherGuard, Clear, 13" dia. Erva Three Piece Birding Pole, Black, 6' 8" x 1" O.D.